Yesterday we headed to shore at Taroa Island to check-in with the acting mayor, submit our permit and pay our $25 visitors fee for the atoll of Maloelap. Landing in front of the conspicuous pale blue Protestant Church we sadly encountered an adult Hawksbill tethered to shore. The turtle had a few holes drilled in the trailing edge of its shell affixing it to a line leading up the beach to a palm tree. Just behind the palm tree was outdoor an kitchen, so we can only guess what might be the main course for Christmas dinner. The turtle was fruitlessly swimming away from shore in the shallows and it's imminent demise tugged at our heart strings. Turtle for Christmas dinner awaits it's fate tehered to shore. It's about 3' (1m) long. Further ashore in front of the Protestant Church we encountered several men, women and children all of whom were quite shy. Church at Taroa, Maloelap Marshall islands. Second blue house on left is the home or Reverend Standin. Eventually we met Reverend Standin (it makes me smile every time I say or type that name:) who was very nice and let us know that the acting mayor should soon arrive from the island of Ollot Island. In the interim we were welcome to go anywhere we liked on the island (Taroa) or sail towards Ollot island if we so wished. It was all very casual. The Reverend Standin lives near the church, has 5 children a friendly wife and two mother cats and lots of 1 month old kittens. We enjoyed holding a few of the kittens and the Reverend Standin offered a few to us. We were tempted to bring a few back to the boat, but they seem a bit young to leave their mother. We headed off for a walk on the north side of the island, drawn by the lonely anti-aircraft gun on the sand spit. After a few photos of the rusty old gun we walked the beach toward the ocean marvelling at the number of broken blue bottles on the beach. Did a ship full of blue bottles sink sending 1.5 liter blue bottles adrift or were these war relics. 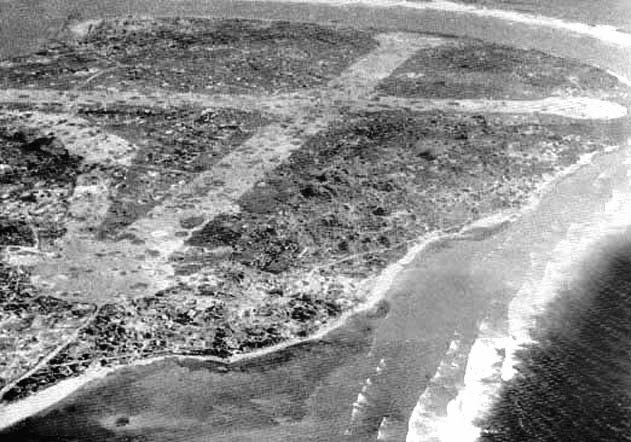 Taroa was the heavily fortified home to 3000 Japanese troops supporting 2 airstrips and a contingent of Zeros and Betty Bombers. 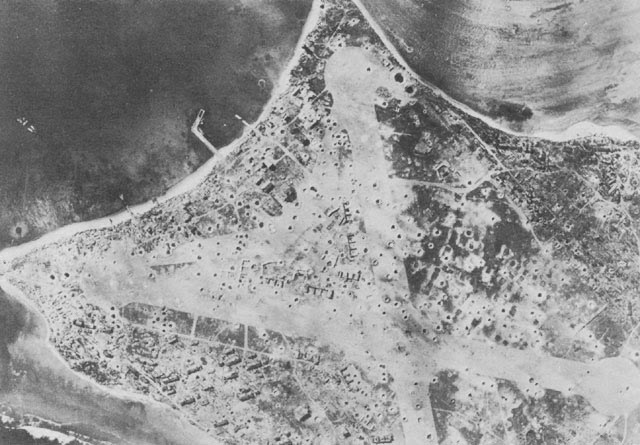 Remains of Taroa after US forces bombed and shelled it to oblivion. We anchored to the North of the pier seen in the upper left of this photo. And found remains of airplanes on the top right near the end of the runway. Remains of the fierce battles between the Japanese and US warships and planes literally are everywhere. Walking the beach, concrete pill boxes pock marked with bullet blasts line the shore, and big guns, that weren't blow to bits still point seaward. Kathy stands in the shallows near a gun that must have been blown from it's base. Close up of blasted gun. I picked up a few rounds for this photo, but put them back where I found. Bullet second from right shows rifling marks indicating it was fired. I think it's a 50 cal round that would have been fired from a US fighter or bomber? Japaneese Rice bowl with a print of Mount Fuji on the bottom. At low tide metal war debris still litters the scoured coral abutting the atoll. In certain places you can look closely and see 2 or 3 rifle bullets resting in coral crevices. I picked up a few bullets for a photograph, but didn't take any home as the historical significance of these scattered artifacts should not be sullied by collectors. I did identify several large 50 caliber? rounds complete with rifling marks that were fired from a US Hellcat? And there were tons of Japanese rifle bullets in the 6-8 mm range mostly missing the cartridge, but not fired. More big guns, some still standing on their turrets and others half buried in coral. On our way back we cut across the edge of the island amongst the palm trees and weaving between huge shell craters from B24 and B25 bombers or huge naval guns? To our surprise we discovered many many planes in the bush. Mostly Japanese Zeros and Betty Bombers filled with strafing holes that must have been shot up on the ground. Pretty much all the pieces were there, but deteriorating in the salty tropical heat. Did a bullet hit this propeller? Back at the village, the acting mayor had yet to arrive so we headed to the boat for lunch and a snorkel. Just off the island of Taroa lies a 300' Japanese supply ship Terushima Maru, sunk by US forces. Its all snorkel-able with the maximum depth at the huge stern propeller of 47' (prop center is at 43'). The lagoon waters are clear (I've read best at low tide) and the ship ranks as one of our favorite snorkels of all time. The wreck is easy to locate as the ships masts still stick more than 40' out of the water and provide a convenient locations to secure the dinghy for a snorkel. Terushima Maru mast with LightSpeed faintly visable in the distance on the left. 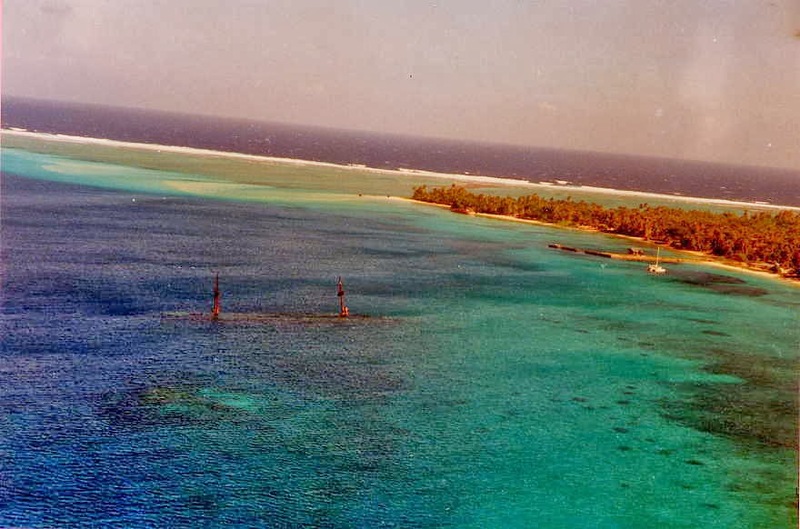 Taroa Island, Maloelap atoll Marshall Islands. Terushima Maru yop masts still stand 70 years later. We made 4 full passes of the ship exploring the top sides and port and starboard and even some of the holds. Lots of fish, but no sharks. The partially submerged wreck of the Japanese freighter Terushima Maru, off Taroa Island, Maloelap Atoll. The vessel was sunk by US aircraft during World War II. Kathy focused mostly on the marine life and I tested my free diving skills checking out the nooks and crannies and diving down to the bottom to measure the depth with my free diving watch. It was on our third pass of the ship from bow to stern that I explored the holds forward of the aft masts. Swimming between some huge cross beams I peered into the second below deck level and spotted the depth charges. Kathy took a looks as well, then tempting fate I swam down between the decks and some dangling wires to get a close and personal view of the depth charge canisters. Not a mom approved moment. These depth charges are still live and some say that if the ship deck collapses over time and the charges roll or fall down to the depth of 33' they may very likely explode as it was customary to set the charges to blow at 33',, my dive watch puts them at 26'. It may seem a bit crazy, but the Marshall islands still have plenty of unexploded ordinance in the form of bombs near many of the best wreck dives. As a side note the war ships used in Bikini atoll nuclear tests atoll were fully loaded including fuel, planes bombs and ammunition to see what would happen when subjected to a nuclear blast. For those enthusiastic divers with re-breathers and enough cash for the dive charter to Bikini, it's possible to dive the flight decks of the USS Saratoga and swim amongst the planes. Today we tried to track down the mayor and eventually proffered our permit and cash to another guy at Taroa and received full permission to do whatever wherever we wanted within the atoll. All we really want to do is kiteboard, snorkel and walk the beach a few times. So, we cruised up the lagoon to Pigeeyatto island for some kite-boarding. We found a decent pump up and launching beach (coral rubble and sand) just to the north of Pigeeyatto that works well at low tide. Looking SE toward Pigeeyatto island. Sandbar as shown at low tide. Kathy ready to go kiting at Pigeeyatto island sandbar. After kiting we had a nice snorkel from the boat and enjoyed healthy coral and tons of fish of every size and description. Dave flying the new F-One bandit 12m and wishing for a little more wind. We're still total beginners, but having fun. Kathy kiting... her sixth session. Kahty popping up, but winds are a bit light.